An hydrocarbon is an organic chemical compound that is comprised only of carbon (C) and hydrogen (H) atoms. Many oils, fats, waxes, solvents and paraffin are either hydrocarbons or contain large hydrocarbon sub-units. Note: The terms "saturated" and "unsaturated" also refer to the concentration of solutions. These have a much different meaning and context. Hydrocarbon fires require a Class B extinguishing agent. Purple-K is one of the best such agents for Class BC fires. Get your PK-extinguishers or bulk powder from Safety Emporium. A saturated hydrocarbon (or other organic molecule) has utilized all of its bonding electrons to make single bonds to other atoms. It can not make additional bonds without cutting off part of the existing molecule. An unsaturated hydrocarbon (or other organic molecule) contains double or triple bonds between certain atoms. These bonds may be broken and new atoms attached without disrupting the existing skeleton of the hydrocarbon. If a molecule contains a saturated hydrocarbon sub-unit, this sub-unit is called an alkyl group. If the sub-unit is an aromatic group this sub-unit is called an aryl group. For carbon, the maximum (and ideal) number of bonds is four. Let's look at an example. trans-3-hexene is unsaturated because the atoms shown in red have two bonds connecting them and are bound to only three different atoms. If we chemically add hydrogen atoms to the red carbons, this reduces the carbon-carbon double bond to a single bond and gives the red carbons four single bonds to other atoms. The resulting molecule, n-hexane, is saturated because we can not add any more atoms to it without removing bonds to existing atoms. You may have heard the terms monounsaturated, polyunsaturated, and saturated in reference to fats and oils. Saturated fats (no double bonds) contain long hydrocarbon sub-units (alkyl groups). Examples are coconut oil and lard, which have a tendency to clog your arteries because of their chemical and physical properties. Unsaturated fats, those with one (mono) or many (poly) double bonds, are less likely to form artery-clogging plaques. A saturated hydrocarbon is called an alkane. The suffix "ane" in a hydrocarbon name denotes an alkane. A hydrocarbon with a double carbon-carbon bond is called an alkene. This is also called an olefin using older terminology. The suffix "ene" in a hydrocarbon name denotes an alkene. A hydrocarbon with a triple carbon-carbon bond is called an alkyne. This is also called an acetylene using older terminology. The suffix "yne" in a hydrocarbon name denotes an alkyne. Note: These are for simple molecules only. Systematic names are much more involved. See the IUPAC link below for systematic naming rules. The following prefixes are commonly used for simple hydrocarbons, but are not part of the systematic naming scheme used by chemists. For systematic naming rules (vital to name a hydrocarbon with more than one branch! ), see the IUPAC link below. Hydrocarbon chains that are completely linear are called normal alkanes. These are given the prefix n-, although this is often omitted. Hydrocarbon chains that contain a carbon atom connected to three other carbon atoms are given the prefix iso. Hydrocarbons that contain a carbon atom connected to four other carbon atoms are given the prefix neo. These molecules have the same chemical formula (C5H12), but a different arrangement in each case, so we call them isomers. These isomers of pentane have different chemical reactivity and properties because of their different molecular arrangements. For example n-hexane is a neurotoxin while neohexane is not. Pay close attention to the name of the chemical with which you're working so you don't end up consulting the wrong sheet. As noted above, pentane and isopentane are two completely different chemicals. Hydrocarbons and their chemical derivatives are often quite flammable. Many of these are toxic or present other health hazards. If possible, susbstitute a less hazardous solvent. Always wear proper gloves and eye protection when working with hydrocarbons or organic chemicals. Be sure to wear an appropriate respirator if ventilation is not adequate, and be careful to avoid ignition sources as the vapors can easily reach their flammable limit. 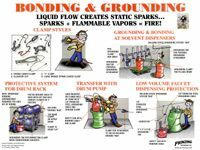 When dispensing bulk quantities of flammable liquids, proper bonding and grounding procedures must be followed to avoid the formation of static electricity which could ignite the vapors. IUPAC (International Union of Pure and Applied Chemistry) nomenclature rules on how to name hydrocarbon molecules. The Reactions of Alkanes, Alkenes, and Alkynes at Purdue University. See also: aliphatic, aromatic, organic.